Pleasant View is a bright and cheery New Englander style house located on a quiet cul-de-sac in the heart of Stonington village. Enjoy views of Stonington harbor, a clean and fresh space with all the conveniences of home and an artist/writing retreat with views of the thoroughfare and islands beyond. Pleasant View is a two bedroom, two bathroom home with a versatile office, which can accommodate an extra guest (or two) but can also be used as a quiet space to catch up on some work, desk space included. The entrance in to Pleasant View is very welcoming. 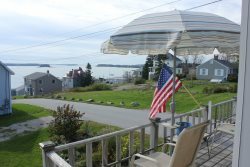 The home has a bright and comfortable breeze way with windows looking out over the distant views of Stonington's harbor. The breezeway has a dining room table comfortable for six guests. The breezeway opens to the kitchen which is nicely equipped. Pleasant View has a dishwasher, a deep basin sink, service for six and all the accessories one needs to pull together most any meal. The kitchen area also includes a breakfast table with seating for four. The living room is also on the first floor and has a sofa, loveseat and arm chair as well as cable television. Completing the first floor of Pleasant View is a full bathroom with a shower. The second floor of Pleasant View has two bedrooms, a full bathroom and a versatile office. The first bedroom has a queen bed, a large closet and a dresser. The master bedroom has a king size bed and a dresser. From the master bedroom there is a balcony that has chairs in place to enjoy the views of the thoroughfare. The versatile office is accessible from the king bedroom and has a desk set-up as well as a full size bed to accommodate an additional traveler (or two). Pleasant View is a lovely in-town home. Enjoy an easy walk in to the village of Stonington where you can grab a meal at one of the local restaurants, view some of the lovely local art in our galleries or grab some souvenirs at one of our great seaside shops. Enjoy a superb vacation at Pleasant View in picturesque Stonington. Ask Us About Bringing Your Pet.